In class group post by Luke, Shane, Leslie, Danielle, and Jillian. Our assigned website was https://deatheaterstudies.wordpress.com/ which featured different blog posts about Harry Potter. 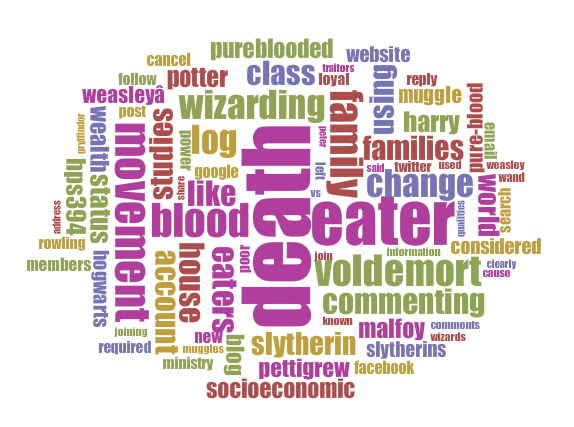 Each section had a different research question; for our voyant use, we decided to put in two blog posts, one asking why there were so many members of Slytherin and the other focusing on the differences of socioeconomic class within the books of Harry Potter. Our goal was to compare these two questions and to see how far the scope of the author’s research extended. As you can see, there are many words that appear that are not in the regular English language that only appear in the Harry Potter world. We can tell that the author is definitely knowledgeable about Harry Potter. If you are looking at this from an outside perspective as someone who has never read Harry Potter before, it would most likely make no sense. The bigger research question could be relating death eaters back to various aspects of the Harry Potter Universe.